Here we are concerned with loess soil. 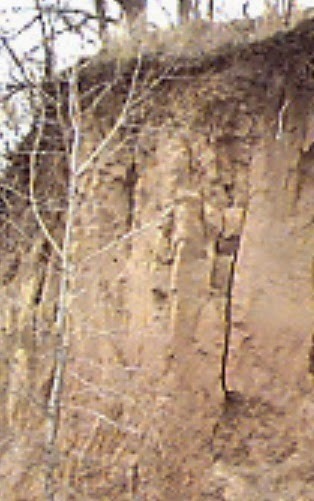 We will try to include some observation about loess soil, provided in last fifty years. These above factors are provided by Howe in 1961. So permeability of soil varies with many local features. In case of loess vertical permeability is much greater than horizontal permeability. Under a specified load, after completion of consolidation, the vertical permeability is found in between (1x10-5 to 1x10-3) cm/sec. He worked with Peoria loess, Kansas; he concluded that vertical permeability was around 9x10-4 cm/sec which is much greater than horizontal permeability. The higher permeability associated by presence of vertical shrinkage and tubules joints in soil deposit with many other causes. But determining the permeability of loess soil is how much realistic as the structure of loess collapse under saturation. In 1961, Terzaghi expressed his view about loess; the permeability of this soil is quiet elusive as soil structure changes under saturation. Sheeler, 1968 also concluded that the structure becomes dense and break down to reduce permeability. Dear reader we will discuss about shear strength parameter of loess soil in our next post.